Children’s picture book author Barnett and illustrator Robinson engage with young fans ages 6-10 for a sidewalk chalk-drawing extravaganza celebrating their new book. It’s the story of Leo, a ghost who leaves the home he occupies when the family who moves in rejects his friendly gestures. Come participate! Mac Barnett, Jory John, Jon Scieszka, Jonathan Auxier, Tom Angleberger - Middle Grade Extravaganza! Wednesday, April 15 at 6PM Super Awesome Fantastic Stupendous Amazing Unbelievable Incredible STAR-STUDDED ABRAMS BOOKS Middle Grade Author Event!!! Mac Barnett JORY JOHN Jon Scieszka Jonathan Auxier Tom Angleberger Many thanks to Abrams Books for arranging to send all of these authors to BookPeople while they're in town for the Texas Library Associaton's Annual Conference. Ladies and gentlemen, boys and girls, fun-loving friends of all ages, join us this evening when not one, not two, not THREE, but FOUR super awesome fantastic stupendous amazing unbelievable incredible middle grade authors are here at BookPeople AT THE SAME TIME!!! Mac Barnett, Jory John, John Scieszka Jonathan Auxier and Tom Angleberger will hold court simultaneously on our second floor this evening. How will this work? Can BookPeople event HOLD this many authors at once? We'll find out! All four authors will be speaking about and signing their latest books. Don't miss this incredible feat of middle grade author shenanigans! ABOUT THE BOOKS Mac Barnett & Jory John will be here with their new book, The terrible two. Miles Murphy is not happy to be moving to Yawnee Valley, a sleepy town that's famous for one thing and one thing only: cows. In his old school, everyone knew him as the town's best prankster, but Miles quickly discovers that Yawnee Valley already has a prankster, and a great one. If Miles is going to take the title from this mystery kid, he is going to have to raise his game. It's prankster against prankster in an epic war of trickery, until the two finally decide to join forces and pull off the biggest prank ever seen: a prank so huge that it would make the members of the International Order of Disorder proud. Jon Scieszka will be here with Frank Einstein and the Electro-Finger. In this second book in the series, Frank Einstein (kid-genius scientist and inventor) and his best friend, Watson, along with Klink (a self-assembled artificial-intelligence entity) and Klank (a mostly self-assembled artificial almost intelligence entity), once again find themselves in competition with T. Edison, their classmate and archrival--this time in a quest to unlock the power behind the science of energy. Jonathan Auxier will be here with The Night Gardener. This follow-up to Auxier's exceptional debut, "Peter Nimble and His Fantastic Eyes, " is a Victorian ghost story that follows two abandoned Irish siblings who travel to work as servants at a creepy, crumbling English manor house. But the house and its family are not quite what they seem. Tom Angleberger will be here with The Rat with the Human Face. Lyle Hertzog and his friends Marilla and Dave are the Qwikpick Adventure Society, three kids who seek out adventure in their seemingly quiet hometown of Crickenburg. On the hunt for their next big adventure—something to top the Fountain of Poop, if that’s even possible—the kids overhear a construction worker telling his buddies about a rat with a human face he saw in the basement of an old research facility. The decision is unanimous: the next adventure for the Qwikpick Society is on! 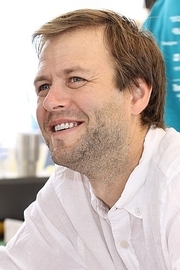 ABOUT THE AUTHORS Mac Barnett is a New York Times bestselling author of over 18 books for children, including two Caldecott-Honor-winning collaborations with Jon Klassen: Sam & Dave Dig a Hole and Extra Yarn, which also won the Boston Globe-Horn Book Award and the E.B. White Read-Aloud Award. He writes the Brixton Brothers series of mystery novels and, with Jory John, The terrible two. He lives in Berkeley. Jory John is the author of the picture book Goodnight Already! and the forthcoming I Will Chomp You! (with Bob Shea) and coauthor of the national bestseller All My Friends Are Dead and a sequel, among other humor books. Jory is also the editor of Thanks and Have Fun Running the Country: Kids’ Letters to President Obama. He spent six years as programs director at 826 Valencia, a nonprofit educational center in San Francisco. Jon Scieszka has sold more than 11 million books, including The Stinky Cheese Man and Other Fairly Stupid Tales, The True Story of the 3 Little Pigs, the Time Warp Trio series, Guys Read, Spaceheadz, and Battle Bunny with Mac Barnett. He lives in Brooklyn, New York. Jonathan Auxier teaches creative writing and children's literature. He is the author of "Peter Nimble and His Fantastic Eyes," which the "Wall Street Journal" called "as delightful a magical story as readers ages 9-14 will hope to find." He lives in Pittsburgh with his wife and daughter. You can visit him online at thescop.com. Tom Angleberger is an American children's writer, best known for the Origami Yoda series. As of March 2013, 3.3 million of his novels were sold around the world. He has also published children's books under the name Sam Riddleburger. Friday, March 6, 2015 6:30-7:30 p.m.
Join Miss Lisa N as she reads stories about BIRDS! We will be making a bird in a bird cage for our craft. We'll get to nibble on an edible bird's nest with chocolate eggs for our snack! We'll be reading On the Wing by David Elliot, A Funny Little Bird by Jennifer Yerkes, Telephone by Mac Barnett plus one more BIRD book! Meet comedic authors Mac Barnett and Jory John as they discuss and sign copies of their new collaboration for readers ages 9-12. The School Library Journal says, "Coauthors and friends Barnett and John have created a fast paced, laugh-out-loud novel sure to appeal to those who appreciate a good prank and have a sense of justice...a good candidate for reluctant readers and a natural next read for fans of Jeff Kinney's Diary of a Wimpy Kid series. JORY JOHN & Mac Barnett So much fun is in store for kids when Mac Barnett & Jory John stop in with their new title, The terrible two. It's prankster against prankster in an epic war of trickery, until the funny foes finally decide to join forces and pull off the biggest prank ever seen. Middle grade readers will love this one! Diesel, A Bookstore in Larkspur welcomes Mac Barnett to the store as our guest bedtime book author on Friday, January 9th at 6pm. Pull on your PJs and bring your teddy bear to the bookstore! Author Mac Barnett will be here to read you a bedtime story. Get cozy in front of the fireplace, listen to a story or two, have some milk and cookies, get your books signed, and then head home for bed. With perfect pacing, the multi-award-winning, New York Times best-selling team of Mac Barnett and Jon Klassen dig down for a deadpan tale full of visual humor. Sam and Dave are on a mission. A mission to find something spectacular. So they dig a hole. And they keep digging. And they find . . . nothing. Yet the day turns out to be pretty spectacular after all. Attentive readers will be rewarded with a rare treasure in this witty story of looking for the extraordinary -- and finding it in a manner you'd never expect. Mac Barnett is the author of several picture books, including Billy Twitters and His Blue Whale Problem, Guess Again!, and Oh No! : Or How My Science Project Destroyed the World. He also writes the Brixton Brothers series of mysteries. Mac is the founder of the Echo Park Time Travel Mart, a convenience store for time travelers, and serves on the board of 826LA, a nonprofit writing and tutoring center. Our Kids' Pajama Party Series is held on the first Friday of every month - keep up with store events by liking us on Facebook or joining our email list! The multi-award-winning bestselling team of Barnett and Klassen dig down for a deadpan tale full of humor in their new book. Together they collaborated on the Caldecott Honor book Extra Yarn. Klassen is the author-illustrator of the Caldecott winner This Is Not My Hat. A not-to-be-missed event! Mac Barnett's book Circle is currently available from LibraryThing Early Reviewers. Mac Barnett is currently considered a "single author." If one or more works are by a distinct, homonymous authors, go ahead and split the author. Mac Barnett is composed of 2 names. You can examine and separate out names.